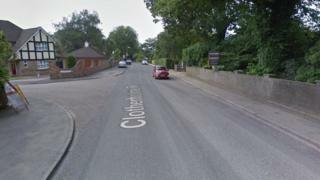 A teenage boy is critically ill in hospital after being hit by a car as he walked to school. The 14-year-old was seriously injured on Clotherholme Road, near the junction of Aislabie Garth, Ripon, on Monday morning. The boy's relatives have been informed and are with him in hospital. The road has been closed pending investigations by emergency services and is likely to stay closed for several hours. Drivers are urged to use alternative routes to prevent congestion in the area. Anyone who witnessed the incident, which involved a silver car, is urged to contact North Yorkshire Police on 101.